American DJ Jelly Fish Unique Lighting Effect with Special Clear Case DJParts - All Variety of Parts that DJ Needs. 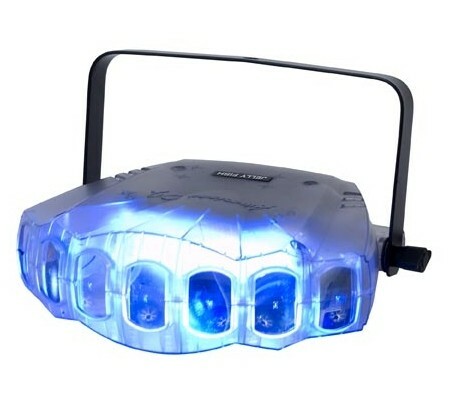 • 84x 5mm LEDs 21 Red, 21 Green, 21 Blue & 21 White LEDs) • 2 DMX Modes: 3 Channel mode or 28 Channel mode for programming flexibility • No moving parts! - No Duty Cycles! - Runs extremely cool! - Run all night! Designed for continuous long-lasting operation • 3 operational modes: DMX-512, Master/Slave or Sound Active • Built-in “high-energy” lighting programs (Master/Slave & Sound Active) • Beam angle: 116 degrees • Color strobe effect (fast to slow) • Electronic Dimming 0 - 100% • Linkable via 3-pin XLR cable • 4-button LED DMX display on rear panel • IEC IN/OUT on rear to daisy chain power (up to 46 JELLY FISH) • Includes mounting bracket • Compatible with the UC3 easy-to-use controller (sold separately) • Power Consumption: 13W max • Long life LEDs (100,000 hr. rating) • Multi-voltage operation: AC 120-240V 50/60Hz (IEC Plug) • Dimensions without bracket (LxWxH): 8”x12.5”x7.25” / 250x317x182mm • Weight: 5 lbs. / 2 kg.